BBC director general Tony Hall has said he believes the licence fee has "got 10 years of life left in it". His comments come after a group of MPs said earlier this year the TV licence did not have a long-term future and was "becoming harder to justify". Lord Hall agreed the licence fee needed to "adapt, modernise and change". He said the government's suggestion of introducing a household tax was a "very interesting idea", but did not know if it would work in practice. Speaking to the BBC's Andrew Marr, Lord Hall said there was broad agreement for the licence fee to be reformed to ensure "everyone is paying equally for it". 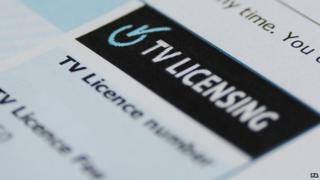 The licence fee currently costs £145.50 per year for every household where people watch or record live TV. It is not required to watch catch-up TV, using services such as the BBC iPlayer. "Reform is up for the government to decide and have a debate," Lord Hall said. "We suggested ways of reforming it so whatever way you consume and use BBC services you can pay for it. Somewhere in there lies a solution." However the director general dismissed the suggestion of replacing the charge with a subscription model to pay for the BBC's output. "By everybody paying something, we all get great services for a lot less than if you went down a subscription model route," he said. The new Culture Secretary, John Whittingdale, has been outspoken in the past against the TV licence, describing it as regressive and "worse than a poll tax". One of his first duties will be to oversee negotiations for the corporation's charter renewal next year. The BBC's royal charter determines the level of the licence fee and the other terms under which the corporation operates. Lord Hall said it was "a crucial time for the BBC". He added: "He's very direct about the BBC and the licence fee, but John Whittingdale's report when he was chairman of the DCMS (Department for Culture, Media and Sport) committee said some vey positive things about the BBC. "He knows the sector and loves what the media do - and the arts - and it's a positive way to start."